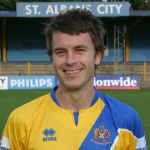 A right-sided player who was is in his fourth season with the club having joined St Albans City from fellow Conference South side Dorchester Town, where he spent two seasons. Commenced his career with Cambridge United before making his debut in the Football League with Peterborough United, has also played for Cambridge City. Has represented Great Britain at the World University Games and also played for England at the indoor Futsal tournament. Struggled to recapture his exciting form from the first half of the 2005-06 season and left the club to join Eastleigh in September 2007 for a fee of Â£6,000.